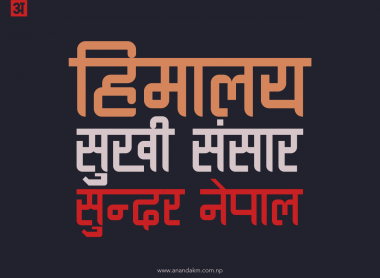 See also Ananda Devanagari Round by Ananda Maharjan (aannda), Ananda Thopla by Ananda Maharjan (aannda). Info: Created on 25th October 2013 . Last edited on 30th May 2015. Although I can't read it - this looks really well balanced. I really must attempt some of the non-Latin languages. I agree with Aeolien and p2pnut. Any chance for a translation of what you wrote in the samples? PREVIEW 3: is a Nepali song.